A beautiful South Hams village, close to Torcross and Slapton Sands. The parish church of St Michael dates to 1431 and stands near the site of an ancient holy well. The church was originally dedicated to St Humbert the Confessor, who died in 1188. The village dates to the Saxon period, and the village name comes from the Saxon word Stoc, and hamme, (meadow). By the Middle Ages the name,e had transformed into Stoke in Hamme, and the entire region forms part of the South Hams district. The Slapton Ley nature reserved borders on Stokenham and offers a wonderful opportunity to observe nature up close. A few miles away is Slapton Sands, famous for its role in the Allied preparations for the D-Day landings. 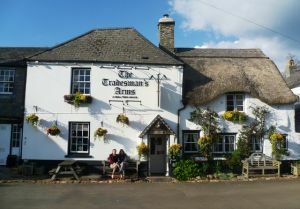 One local highlight in Stokenham is The Tradesman's Arms, which bills itself as one of the prettiest pubs in Devon, and I won't argue with that description. The thatched pub dates to the 14th century, with an atmospheric interior and a very cosy atmosphere as we can attest! We had the pleasure of staying in Stokenham for several days, and we absolutely loved it. There are several old inns, serving wonderful meals, and we were made to feel a part of the community even though we were just tourists. Stokenham would make an excellent base for exploring the South Hams.